I love my insulated travel mug(s) but a lot of the time I’m just working in my office sipping on a bit of Joe. When I’m around the house or working I find myself not wanting to use my big travel mug. Even though my travel mug keeps my coffee hotter longer than anything else I own I find myself gravitating towards regular coffee mugs or insulated desk mugs instead. It just feels better in my opinion. I’ve been trying out a lot of insulated coffee mugs that have lids or smallish wide-base travel mugs and I’ve found I like them a lot. In time I’ll probably post on some of the specific covered coffee cups I’ve tried but for now I wanted to share with you some of the more popular options out there in this category. In most cases these are low cost items that make great gifts for others in addition to being nice splurge items on one’s self. Please note I’ve actually sorted this list by style. You’ll find ceramic/glass mugs with lids in the top section and all other materials in the lower section. The Patterson insulated coffee mug is a newcomer to the space but I do like it a lot. It’s got elements of a desk mug and a travel mug in one package. 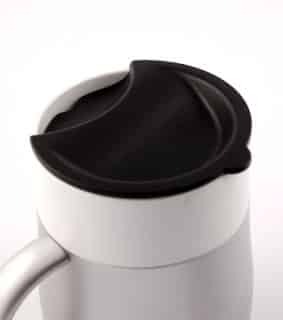 It will keep coffee hot for a long time, will travel with you, has a comfortable handle, and it won’t spill. Competitively priced it’s a good option for lots of people. I’m a huge fan of the Umbria desk mug by Trudeau. It’s a 14-15oz double walled mug that has a super simple lid and looks slick. 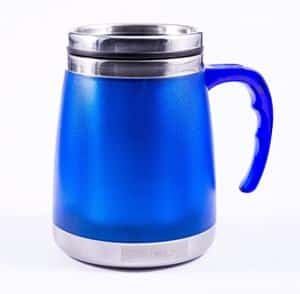 It comes in both blue and red and it keeps your coffee hot for an hour or two depending on how hot you brew your coffee and how quickly you drink it. 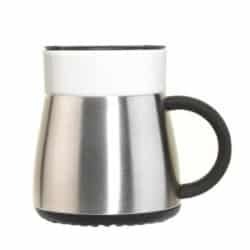 For the price and the quality it’s a good choice for insulated mugs in the home or office – far better than an ordinary ceramic coffee cup and less intrusive and cumbersome than a large/tall travel mug. See my full review of this mug here. Contigo makes some awesome insulated mugs. They tend to be some of the best made. Likewise I find the style of mugs they make to be very appealing and this desk coffee mug is no exception. It comes with a basic plastic lid to cover the coffee and keep heat in while remaining small enough to feel like a normal coffee cup. 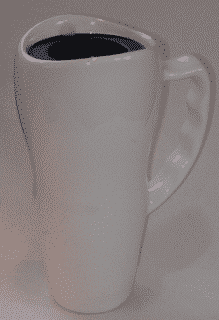 This is a really cool ceramic mug because it’s basically a travel mug that can be placed in the dishwasher or even the microwave. 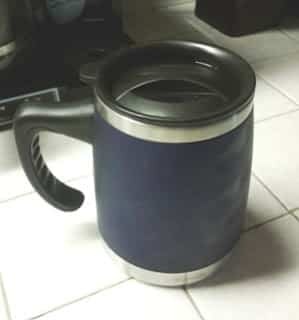 It’s completely ceramic all the way through so it’s not exactly well insulated but the provided lid makes this a much better mug than your run of the mill coffee cups that go cold in 20 min. For the time being these are the basic coffee cups with lids that I am planning on buying to test out. I’ll add more to this list as I run into them and I’ll add links to reviews of these mugs when/if I get around to actually doing them.